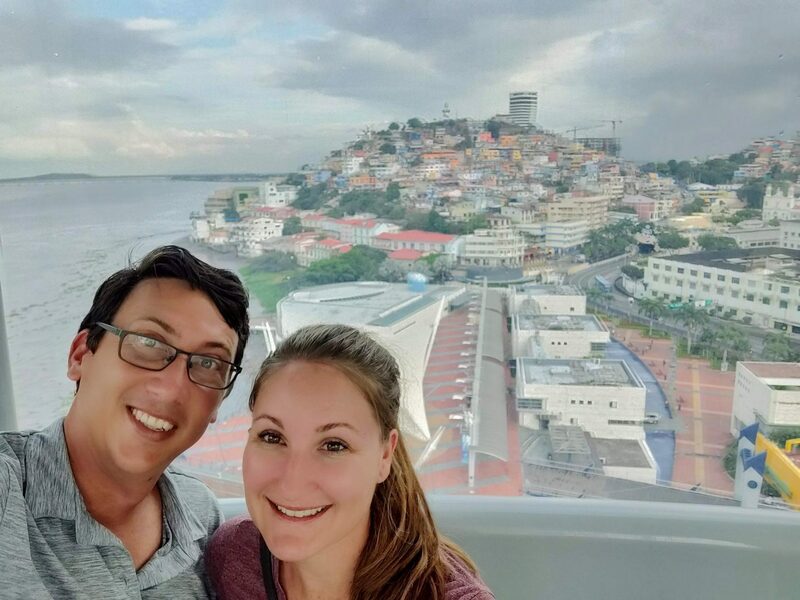 So what to do in Guayaquil, Ecuador? This city can make for an excellent stopover during a trip to Ecuador, as there are so many fun things to do in Guayaquil. 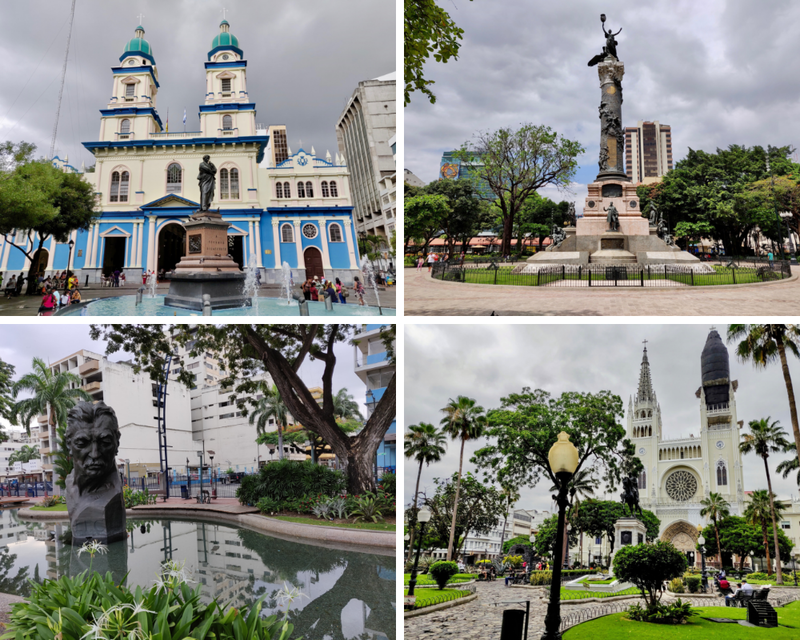 As long-term travelers in Ecuador, we decided to write this detailed Guayaquil travel guide to show why it’s worth the stop, reveal all the best things to do in Guayaquil, and further provide some Guayaquil travel & safety tips. 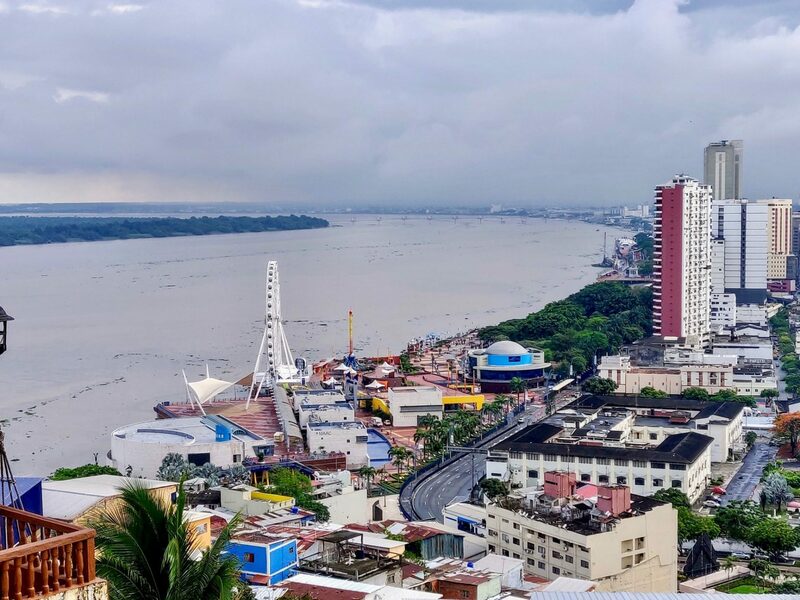 Guayaquil is a popular transit hub for travelers, as it’s home to Ecuador’s second busiest international airport and is the only connection to the Galapagos. Therefore, Guayaquil is often a place that people fly into when taking a trip to Ecuador or on their way to the Galapagos. Hence many visitors bound for the famed islands find themselves passing through this city and wondering is Guayaquil worth visiting? We see this question pop up constantly in travel forums. So what’s the answer to all of these inquiries? Is Guayaquil worth visiting? We say “sí, sí, sí!” That’s a big yes, of course. Guayaquil is most definitely worth visiting in our opinion. There’s actually a good number of fun things to do in Guayaquil to keep curious travelers busy for a few days. We’ll concede that there may be more worthwhile places to visit within Ecuador. After all, this is an amazing country that holds the Andes, the Amazon, the Galapagos, colonial cities, and great beaches. For anyone on extremely limited time, we could understand why bypassing Guayaquil might make sense. Yet those on a short Ecuador trip will be missing out on all the awesome things to do in Guayaquil. 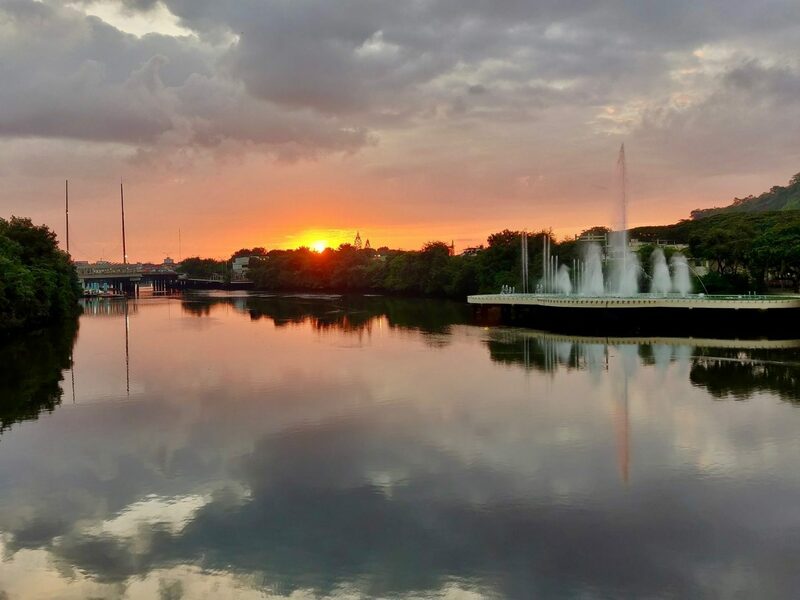 For anyone transiting through the city, Guayaquil can definitely be well worth staying a couple of days to discover all of the charms of Ecuador’s largest city. 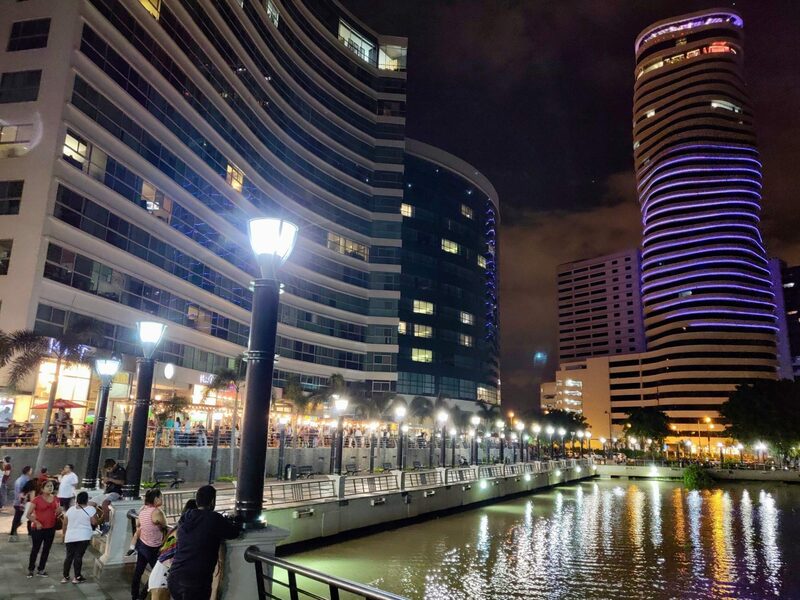 Guayaquil is currently in the midst of a resurgence, as many successful renewal projects have been implemented throughout the city in addition to many new attractions. What once may have been considered a big grimy city, now boasts upscale dining districts and sparkling clean waterfront promenades. It’s a changed place! In the past decade alone, Guayaquil has developed the creative architecture of Ecuador’s tallest building, erected the largest ferris wheel in South America, opened up many trendy entertainment complexes, and has introduced a handful of brand-new tourism initiatives, each adding even more interesting things to do in Guayaquil. Guayaquil is a city that is clearly modernizing and making a concerted effort to appeal to travelers. Yet Guayaquil has still managed to maintain historic charms too. Established in 1538, this port town is one of the oldest cities in Ecuador. Some of the colorful architecture from century’s past can still be seen today while wandering around the hot and steamy city streets. This is the tropics after all! Yet the warm climate can come as a pleasant break for anyone having come from the high Andes running through Ecuador’s midsection. And despite the toasty weather, thankfully most establishments throughout Guayaquil have great air-conditioning systems and aren’t afraid to use them! The warm weather adds to Guayaquil’s tropical character just as much as the broad River Guayas lining the city’s shore. It’s this position on the briskly flowing river that greatly contributes to the city’s uniqueness and even provides for a few things to do in Guayaquil. We found that almost all the main things to do in Guayaquil are completely free, or very inexpensive. Guayaquil is a particularly budget-friendly city in South America and it’s easily possible to explore Guayaquil on a budget. Know that all of the recommendations throughout this Guayaquil travel guide come with prices that all budgets can afford. So we’re now writing this post in an effort to show not only why Guayaquil may be worth the stop, but also to help make the most of a short visit when passing through. Guayaquil has something for everyone to do, whether you’re into nature, culture, history, food, family-friendly activities, or nightlife. The following list is what we found to be the 15 best things to do in Guayaquil! We’ve also marked all the points of interest discussed in this article within the map below. If you were to do only one thing in Guayaquil, our suggestion is to take a leisurely stroll along the Malecón 2000. 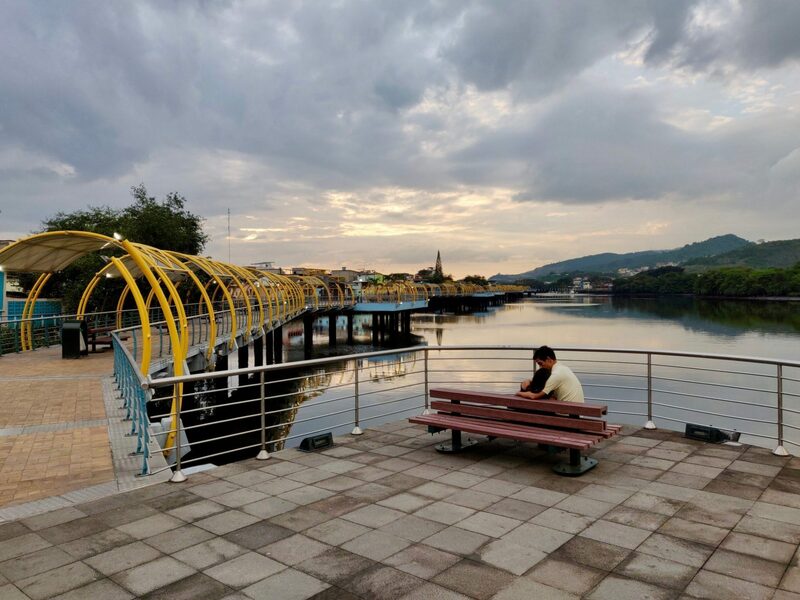 This pleasant 2.5-kilometer boardwalk not only takes in excellent views of the River Guayas, but it winds its way through gardens, monuments, museums, restaurants, and shopping complexes. While in Guayaquil, you’ll hear the boardwalk referred to as Malecón dos mil, which translates to Malecón two-thousand, the year that the new waterfront stretch was opened. The Malecón 2000 is often touted as one of the most successful revitalization projects in South America. What was once a dilapidated riverfront only a few decades prior, is now a thriving waterfront that’s filled with attractions and things to do. The Malecón 2000 takes on different personalities depending when visited. During a weekday you can enjoy the sprawling promenade almost entirely to yourself. Yet on a pleasant weekend afternoon, expect to find thousands of local families gathering for a day of fun on the river. It’s a nice scene to soak in and great people watching. There’s really a lot do along the Malecón 2000 for both locals and visitors alike. In fact, many of the subsequent recommendations of things to do in Guayaquil can be found right along this malecón. 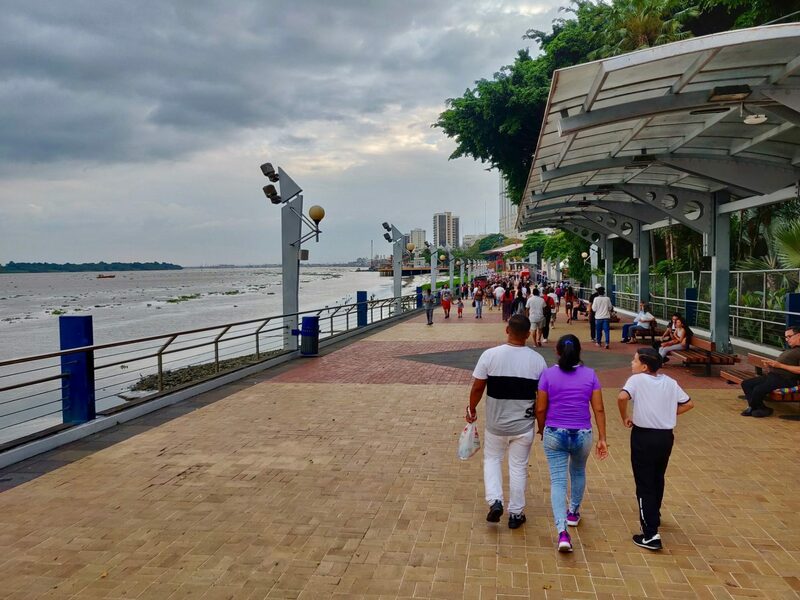 Here are just a few points of interest to look out for during a stroll down Guayaquil’s beautiful riverfront walkway. Torre de Roloj – Iconic clock tower that is lit up at night. 🕒 Hours: 7:00 am-Midnight, although shops and restaurants may not open until after 11:00 am. 📍 Location: 2.5-kilometers along the River Guayas, midsection: here. One of those attractions to check out along Malecón 2000 is definitely La Perla! “The Pearl,” as it translates to in English, was completed in 2015, becoming what is touted as the largest ferris wheel in South America. La Perla soars 57 meters (187 feet) high above the city! During the 12-minute rotation into the air, the giant ferris wheel offers incredible views of the river, the boardwalk, and city skyline. Each gondola is air-conditioned too, which comes as relief while walking around the hot city. And we found there to usually be surprisingly few people riding La Perla, so a lack of queuing and a private ride can be an added bonus to experience. You’re even more likely to avoid any crowds on a weekday visit. It’s then that prices of La Perla drop from a mere $5 to the bargain price of $3.50. Be sure to bring a camera, as the pods provide for some great photo opportunities when in a high position. And since La Perla is located on the northern end of Malecón 2000, the giant ferris wheel also has some of the best views of the colorful hillside community known as Cerro Santa Ana, which is another must-see place in Guayaquil, as we show in the next thing to do in Guayaquil. 📍 Location: Northern end of Malecon 2000: here. 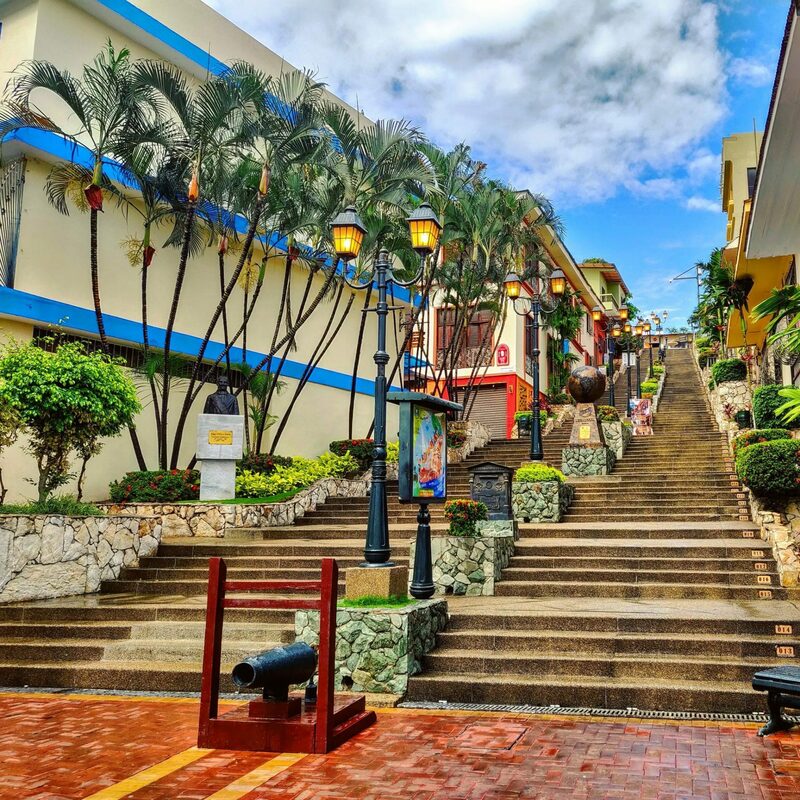 On the northern fringe of Malecón 2000 is where to find what is arguably the most beautiful neighborhood in Guayaquil, Las Peñas. It’s a historic neighborhood that dates back over 400 years! The colorful hillside enclave of Cerro Santa Ana has retained the allure of bygone eras. Quaint homes are perched down narrow alleyways as family-run neighborhood bars offer a most-welcomed reprieve while climbing up the 444 steps leading to the top of the Santa Ana Hill. If there’s any doubt of how far you’ve ascended in Guayaquil’s heat, each step is numbered to provide a gentle reminder. There are plenty of benches and quaint plazas along the way to pause and catch your breath. About every few dozen stairs will be a vendor selling water to help keep you cool and hydrated as you make your way to the top. Reaching step #444 provides a visual reward for the sweaty effort, by offering panoramic views of the Guayaquil and the river down below. Also in the Las Peñas area at the base of the Santa Ana Hill is a scenic cobblestoned street known as Numa Pompilio Llona. 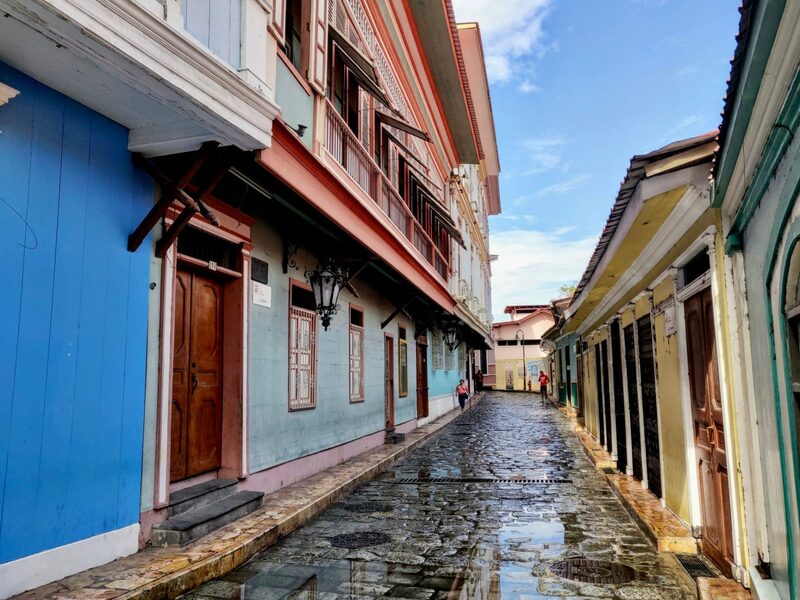 It’s a famous street in Guayaquil that really shows off its wooden colonial architecture. Behind the colorful wooden doors are many artsy stores to pop into. But be sure to make it to the top of Cerro Santa Ana. That’s where there’s a small church and the “El Faro” lighthouse that you can go inside for 360-degree panoramic views down below. Lining the hilltop are canons that were once used to protect Guayaquil from pirates. 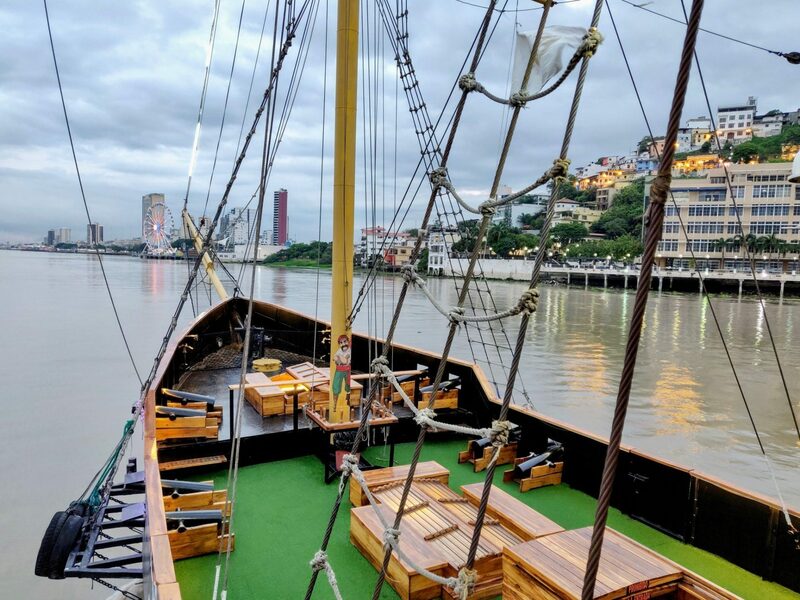 Look beyond the canons and out onto the Guayas River and you may even see a pirate ship floating by. And that’s another great thing to do in Guayaquil! 📍 Location: Just north of Malecon 2000. Start walking the main stairway at step #1: here. 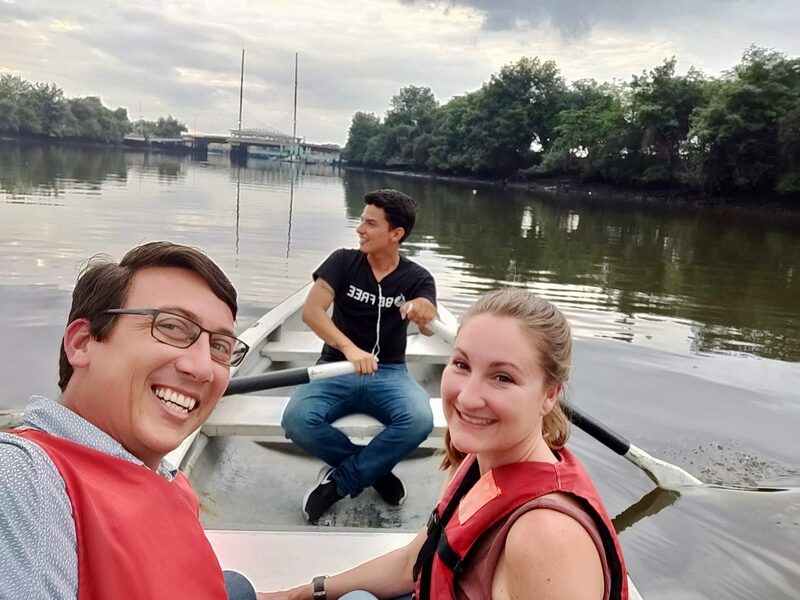 After spending much time admiring the River Guayas from shore, it’s almost a necessary thing to do in Guayaquil to get out onto that river and experience it! Catching the pirate ship to do so is every bit as touristy as it is fun. The hour-long cruise along the River Guayas provides yet another vantage point of the riverfront city. We suggest going for the 6:00 pm cruise to be able to see Guayaquil in the dwindling sunlight as the city begins to light up as the night sky takes over. 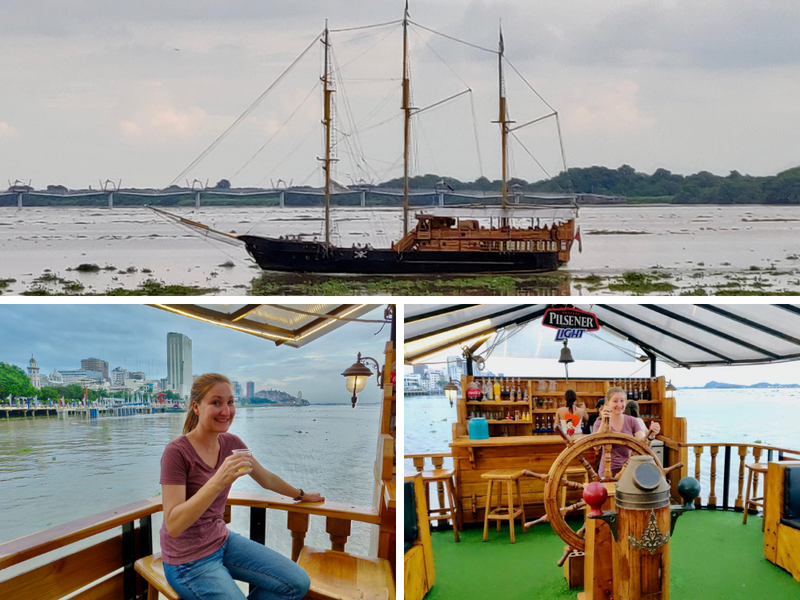 During this pirate cruise in Guayaquil, they play music and serve drinks and snacks, both of which are available for purchase. If you want to kick back a few, we suggest upgrading from the $7 ticket to the $15 ticket, which includes a free-flowing open bar throughout the trip. And we can confirm that they do indeed keep the drinks cold and flowing! It can be a great way to kick off a night on the town in Guayaquil. The Henry Morgan pirate ship voyages beyond the colorful Las Peñas enclave and also past the southern reaches of Malecón 2000. 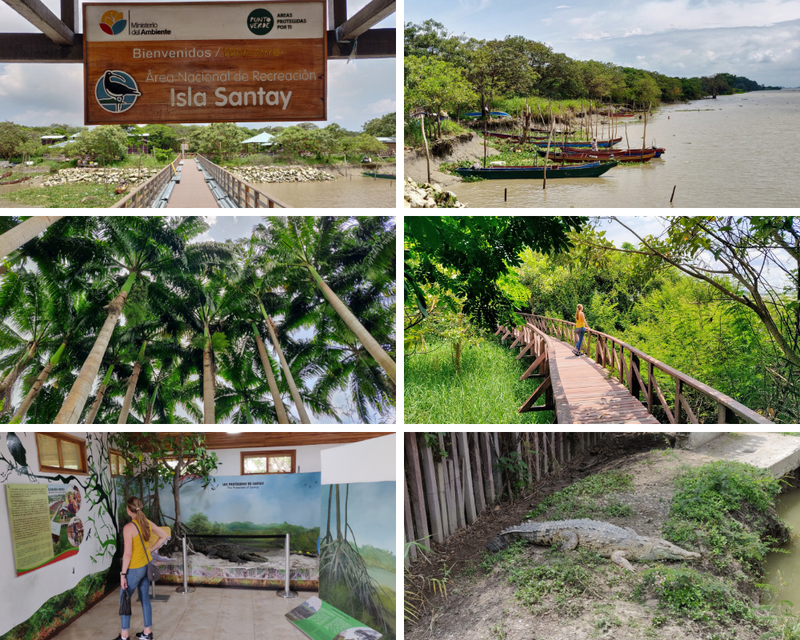 On the opposite side of the river, you’ll cruise past a tranquil island known as Isla Santay, which is actually yet another fun thing to do in Guayaquil! 💲Price: $7 for 1-hour cruise. Or $15 for 1-hour cruise including open bar. Tues, Wed, Thurs: 4:00 pm, 6:00 pm, 7:30 pm. Fridays: 2:00 pm, 4:00 pm, 6:00 pm, 7:30 pm, 9:30 pm. Saturdays & holidays: 12:30 pm, 2:00 pm, 4:00 pm, 6:00 pm, 7:30 pm, 9:30 pm. Sundays: 12:30 pm, 2:00 pm, 4:00 pm, 6:00 pm, 7:30 pm. ⌚ Length of visit: It’s a 1-hour river cruise. 📍 Location: Around the middle of Malecon 2000, right here. Just across the river from the traffic and honking horns on the busy streets of Guayaquil lies a tranquil island that feels worlds away from the city’s urban sprawl. It makes for a fantastic escape into nature from so close to the city. There are no cars at all found on Isla Santay, as a long pedestrian bridge only allows walkers and cyclists onto the island. 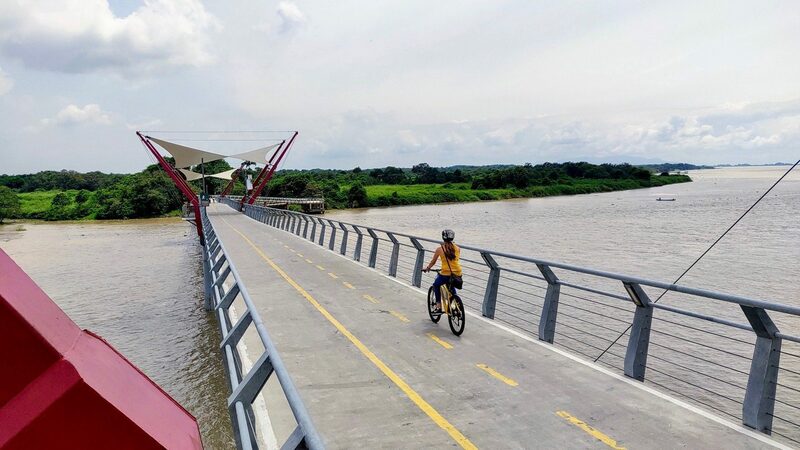 After crossing the Guayas River on that 850-meter long bridge, a well-kept network of boardwalks and pathways weave through a mangrove swamp, tropical forest, and palm canopies that are all filled with hundreds of birds. In fact, over 100 different species call this island their home! The biodiversity on the island further extends itself to 65 different plants and even 25 mammal species. It’s a fairly easy and pleasant stroll of nearly a kilometer across the bridge, plus an extra two kilometers further along the island’s boardwalks. Despite the mostly shaded walk being less than 6 kilometers (less than 4 miles) round trip, we found Santay Island to be a particularly nice place to experience from behind the handlebars! At the base of the pedestrian bridge is a bike rental station with plenty of bikes and helmets to send you on your way. 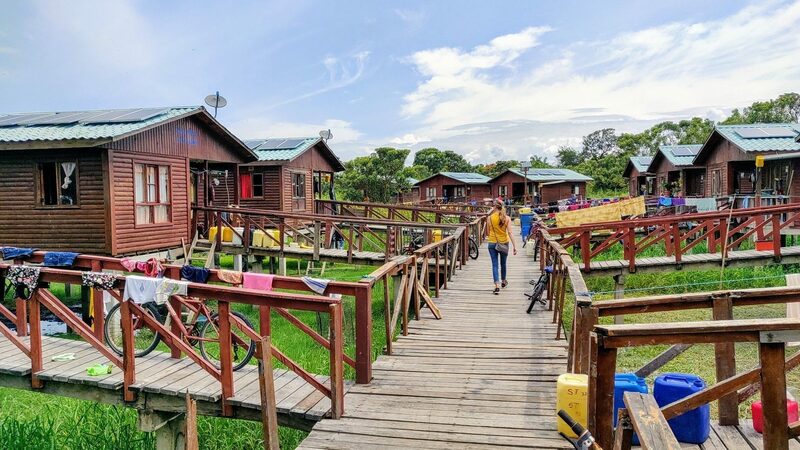 On Santay Island, the winding trails lead to a small fishing village consisting of 235 people that make up 56 families who live in modest homes built up on stilts. Each home includes a living room, dining room, kitchen, two bedrooms, a bathroom, potable water, and solar power. Within the eco-village, there’s also a small museum to learn about the nature of the island and the people who live here. There’s even a short boardwalk with platforms to view crocodiles. There are some snack bars at the entrance of the village. But we recommend holding out for the barren open-air restaurant within the village that offers just a few inexpensive choices on the chalkboard menu. We enjoyed the seco de pollo for $2.50. Near the village entrance, visitors can find the Huaquillas Trail. That’s a half-kilometer walking trail that ventures more into the tropical forest canopy and where the most birds can be found. Mosquitos are thick on this trail, so plan accordingly if you’re going to take the short trek. Between this interesting little village and the nature found throughout the twisting pathways, Isla Santay is all literally a breath of fresh air so close to the big city! 💲Price: Free to enter Santay Island. 🚲 Bike rental info: It’s $4 for 3 hours, including helmet and bike lock. IDs needed as collateral for bike rental. At the entrance to the village, there’s a bike rack to lock up your bicycles while walking around. 🕒 Hours: Hours: 6:00 am – 5:00 pm. 📍 Location: Approximately 2 kilometers further south after Malecon 2000 ends, right here. Take a taxi or Uber. ⚠️ Note: There were once two different bridges connecting to the island, but the bridge from Duran to Santay Island was knocked down by a ship accident and is still out of use as of January 2019. So be sure to use the Santay Island bridge, located here. Parque Historico is one of the Guayaquil’s top attractions. 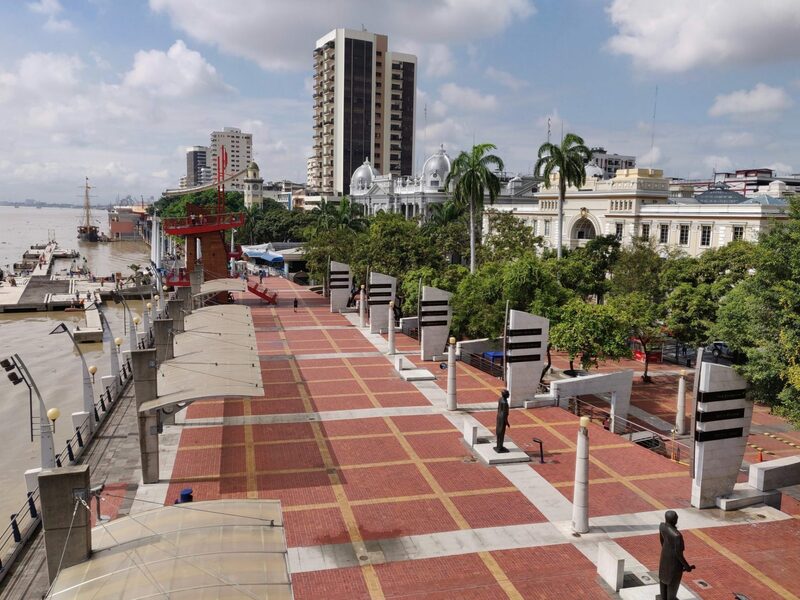 And considering everything that can be found at these large grounds, it’s somewhat surprising that the Parque Historico is yet another awesome free thing to do in Guayaquil. 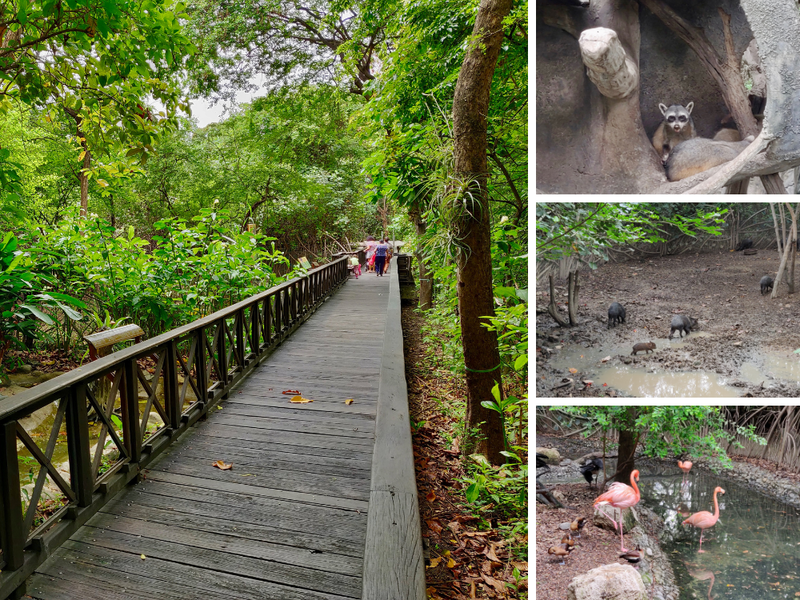 The Wildlife Zone gives a glimpse into local Ecuadorian fauna while meandering across a boardwalk trail. It’s essentially a zoo of sorts, but the animals are living in fairly spacious recreations of their natural environments, rather than in cages. The Urban Zone is like a living history museum, full of beautiful architecture from Ecuador’s colonial heydays of the late 1800s and early 1900s. Some of the buildings are recreations while others were moved to the Historic Park and restored. On weekends, costumed performers have been known to amble about the historical buildings. If you’re not roaming around Guayaquil on a budget, then consider stopping into the onsite 5-star restaurant, Casa Julian, in which the elegant atmosphere rivals the high-end gastronomic delights served at the restaurant. Finally, the Traditional Area gives a glimpse into Ecuador’s rural life and agriculture. Recreations of farm plots and cocoa plantations are found here. 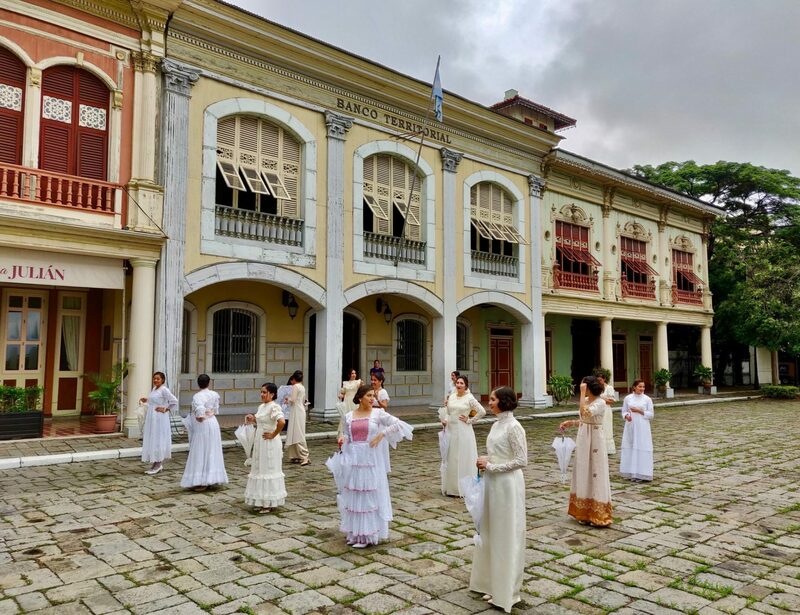 These three areas of Parque Historico all adds up to a must-visit Guayaquil attraction that we recommend venturing beyond downtown to experience. It’s entirely free to visit Parque Historico by heading there on your own. Yet if you’d like to have roundtrip transportation with hotel pick-up and a complete informative English-speaking tour of the vast grounds, then consider this 3-hour tour of the park, a deal at only $30 per person. Check availability on Viator. 🕒 Hours: 9:00 am – 4:30 pm. 📍 Location: It’s about a 15-minute Uber ride (~$5 or less) from downtown Guayaquil or Malecon 2000. Located here. 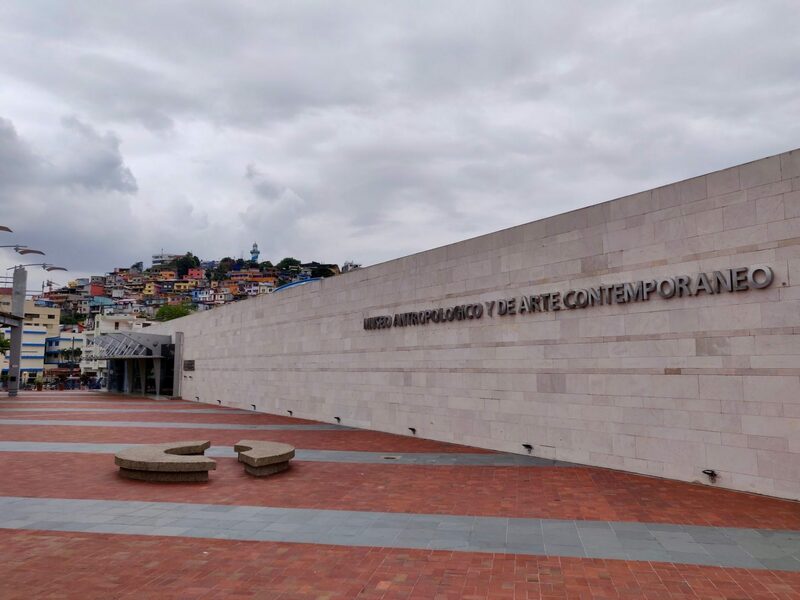 While strolling along the Malecon 2000, the Museo Antropologico y Arte Contemporaneo, abbreviated as MAAC, should be a compulsory stop. Admission to MAAC is entirely free, it’s well air-conditioned, and in a convenient location. 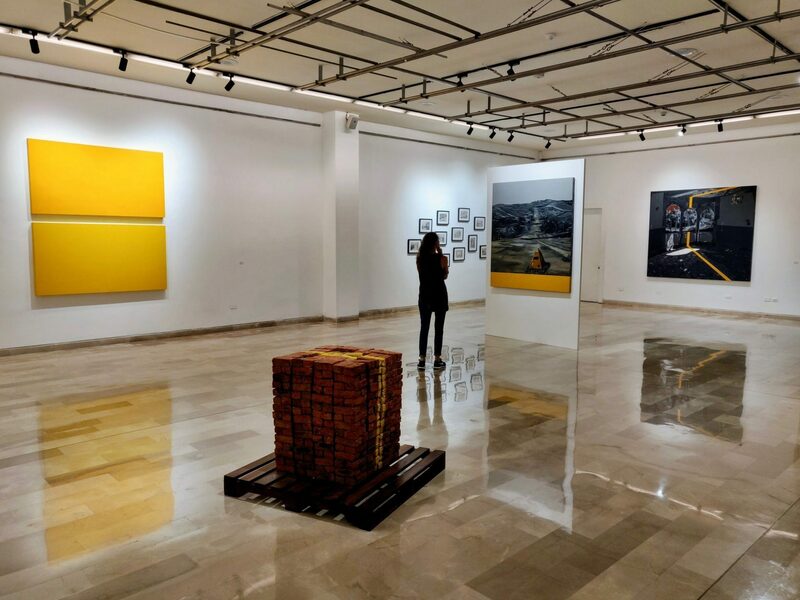 But the real reason to check out the museum is for the Ecuadorian archeology on display and the funky art exhibits. Soon after entering the modern MAAC building with tall ceilings, visitors are first pointed to the contemporary art half of the museum. There are a few different halls filled with peculiar, interesting, and thought-provoking pieces of modern artwork. The Anthropological half of the MAAC displays dozens of ancient artifacts that well predate the Spanish arrival. 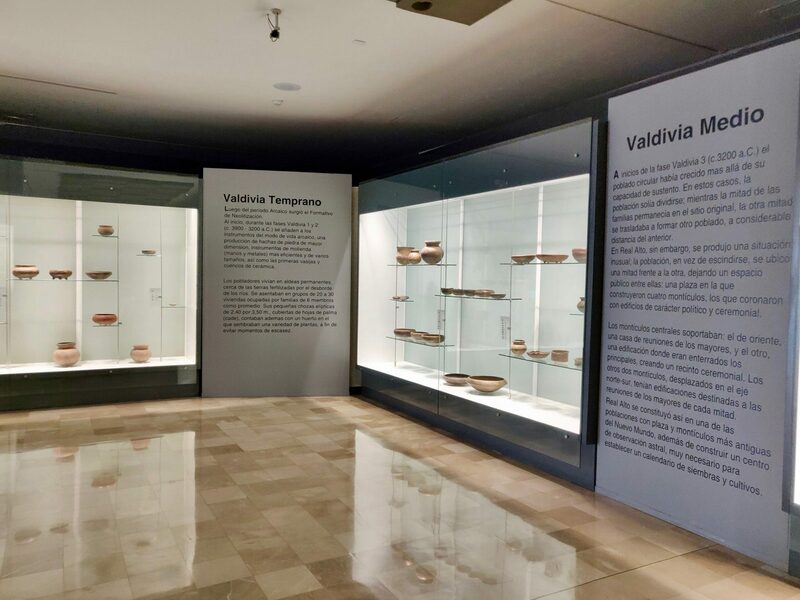 There are many elaborate ceramic pieces on display that were found throughout Ecuador. It’s a nice collection, but do realize that signage is in Spanish. 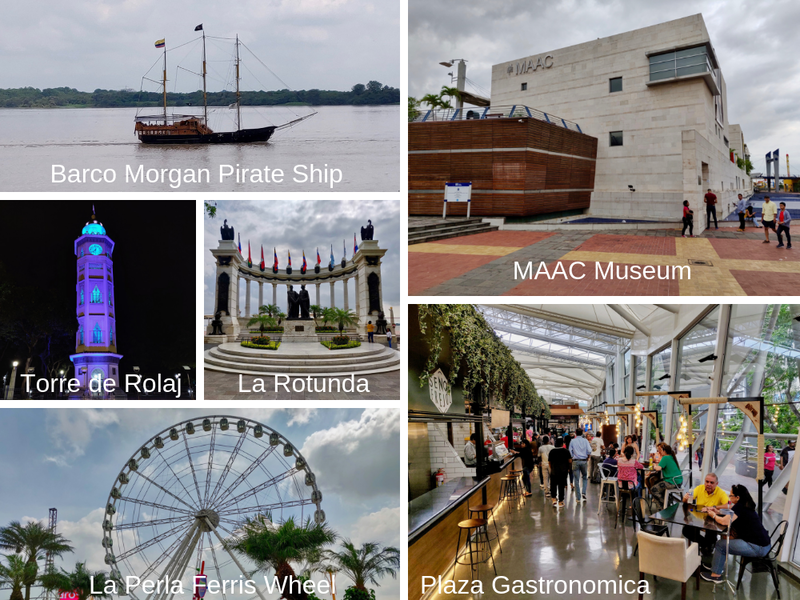 Of the half-dozen museums we visited in Guayaquil, we found the MAAC to not only be the biggest, but also the best and deserving of one of the 15 best things to do in Guayaquil. 🕒 Hours: Tues-Fri 8:30 am – 4:00 pm, Weekends 10 am – 4 pm. 📍 Location: It’s on the northern end of the Malecon 2000. Located here. Parque Bolivar is a quick yet quintessential and iconic stop on any Guayaquil itinerary. It’s here where you can find Guayaquil’s resident land iguanas lazily hanging out right in the middle of the otherwise busy city. That’s why the park is also known as Parque de las Iguanas, or Iguana Park. 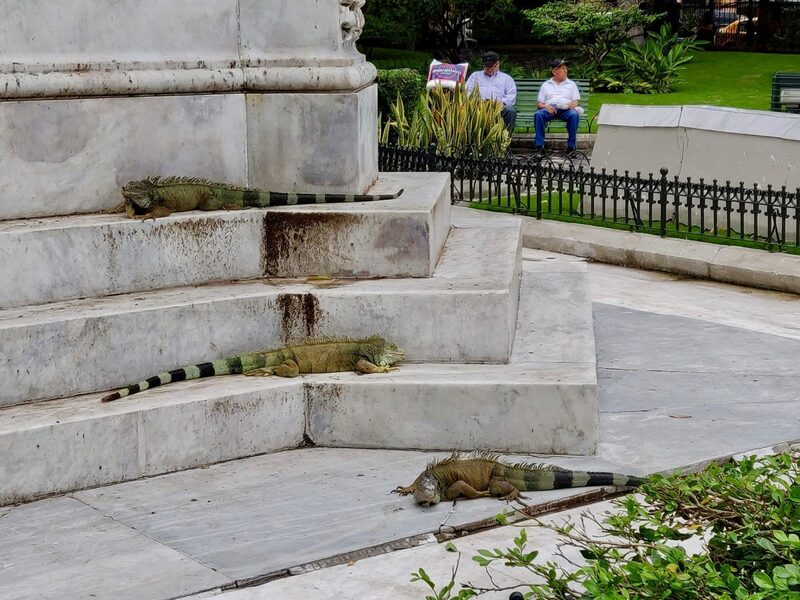 This city square with iguanas is also referred to as Parque Seminario, but don’t let the multiple different names confuse you, as it’s all the same place. If you’ve come from the Galapagos, you may not be overly impressed. But do know that this is a different species of iguanas than what is found on the islands. And if for anyone heading that way, this is a great precursor of what’s to come. It’s a nice yet small park that’s centrally located downtown and only three blocks away from the Malecon 2000. 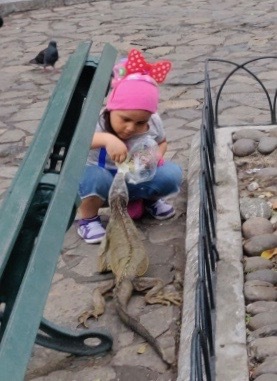 The iguanas are very tame, as locals come to feed them vegetables and flowers, sometimes even by hand. It’s a pleasant setting, located right in front of the Metropolitan Cathedral. The many benches throughout the park can make for a nice place to take a break and watch these reptiles. 📍 Location: It’s three blocks west of the Torre Morisca on Malecon 2000. Located here. The Iguana Park isn’t the only place in downtown Guayaquil worth straying off the Malecon for. 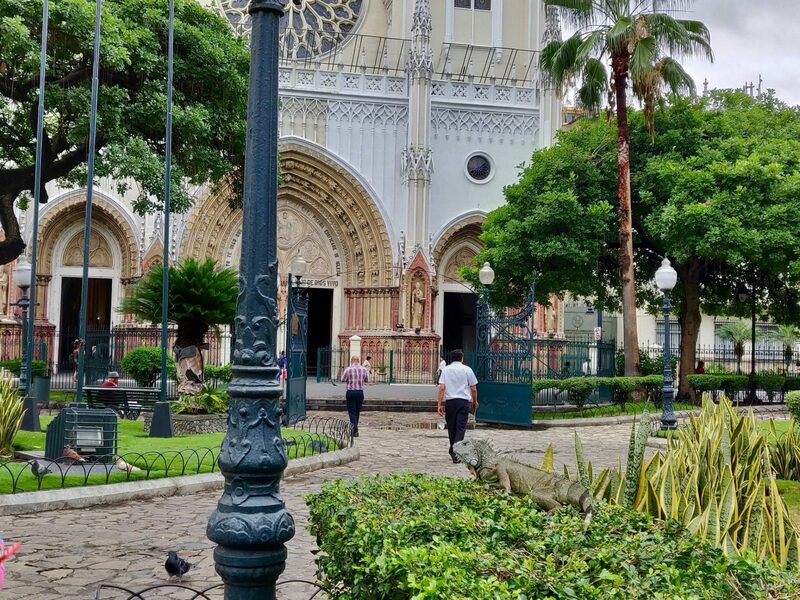 That may be the most popular attraction amidst Guayaquil’s downtown, but it’s worth taking a wander further throughout downtown Guayaquil to explore other parks, monuments, churches, and architectural gems. It’s a safe bet to do this during the day. Parque del Centenario – The largest park within downtown Guayaquil’s contains many monuments. 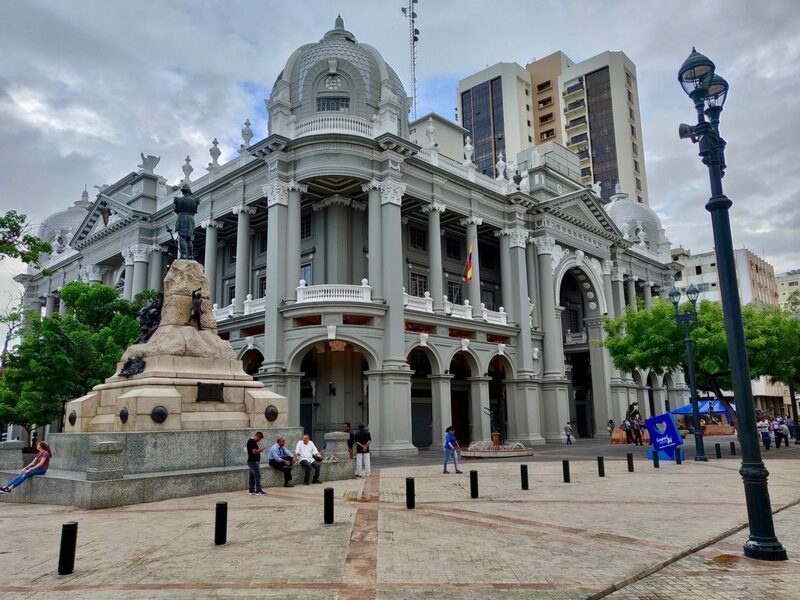 For those who may desire more information about each of these places or don’t feel comfortable wandering around downtown Guayaquil on your own, definitely consider taking a guided tour. This Half-Day Guayaquil City Tour has 9 am and 2 pm pick-ups and is a great way to get acquainted with the city. It not only visits all of the downtown highlights but continues further on the Las Peñas neighborhood and Cerro Santa Ana. And at only $18, it’s a great value tour to take in Guayaquil. Check Viator for current availability and up-to-date prices. Malecón 2000 gets all the love in Guayaquil. And deservingly so, as it’s a very enjoyable waterfront promenade. But it’s actually not the only malecón in town. Malecón El Salado is Guayaquil’s other malecón and sports a different vibe compared to the main Malecón 2000. Walking the entire length of the Malecón El Salado will give visitors glimpses into working-class neighborhoods that is a contrast to the built-up and more polished downtown area and Malecón 2000. Yet these neighborhoods lining Malecón El Salado carry their own special charm. Malecón El Salado can be nice for a sunset stroll too, given it’s westward facing location. There are also snack bars and casual open-air restaurants to stop at along the way. The Plaza de Mariscos, or “Seafood Plaza” makes for a particularly inviting outdoor patio to pause along the boardwalk. If not to have a bite of local fish, stop in for a cervezas while enjoying the live music we found playing here on Friday and Saturday evenings. 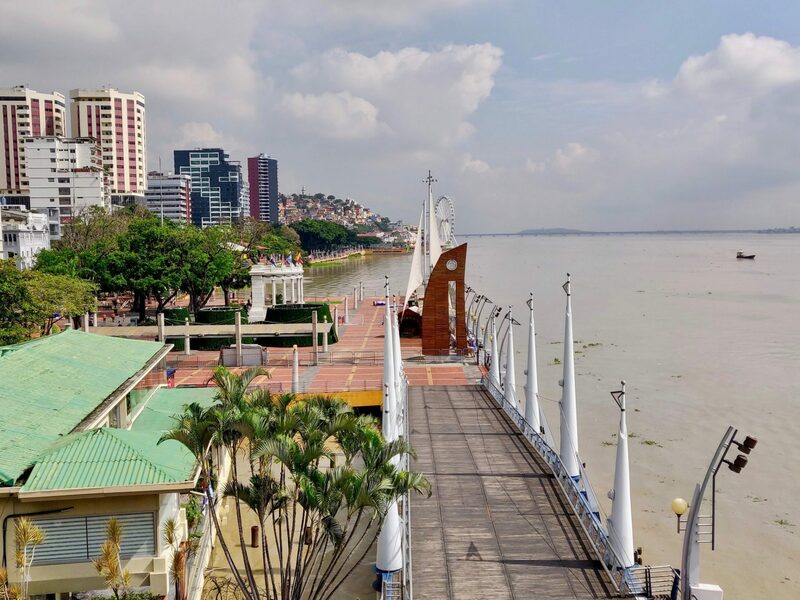 And while the Malecón El Salado makes for yet another nice place to stroll in Guayaquil, there are a few other things to do here that deserve separate mentions of their own. So see below! ⌚ Length of visit: An hour or so, depending if you’re stopping to eat, drink, or partake in one of the subsequent recommended activities. 📍 Location: Along the Salado Estuary. A good central point to have taxi/Uber drop you off at is near the Seafood Plaza: here. There’s a small rowboat rental pier along the Malecón El Salado, right nearby the Plaza de Mariscos. You get a workout by paddling around the river on your own. Or opt to hire a paddler to do the work for you, to instead enjoying a romantic and leisurely row around the estuary. Mangroves line one side of the riverbank, as the boardwalk lines the other side. Other rowboats fill this section of the skinny river, as does the occasional fisherman. The thirty-minute paddle takes 1-4 passengers under a few bridges and past the Monumental Fountain of Dancing Waters, which is another Guayaquil attraction of its own merit. 🕒 Hours: Go during daylight hours, no official hours posted. 📍 Location: The small pier is in front of the Seafood Plaza. Located here. This dancing fountain display is a really impressive attraction in Guayaquil. The fountains blast up 40 meters (131 feet) high in the air. Although the fountains are on in the day, it’s most special to visit them in the early evening. When night falls in Guayaquil the fountains light up and become choreographed to music. It’s really quite the spectacle and much more impressive than we had envisioned. The music ranges from Italian opera to local tunes specific to Guayaquil. It’s like a slightly smaller version of Vegas’s Bellagio Fountains yet the fountains go on to dance much longer here. There’s a platform adjacent to the fountains for an up-close view of the fountains. Yet we recommend watching them from the Malecón El Salado on the opposite side of the river. There’s a snack bar selling beers, empanadas, and more. And the tables set-up on the upper level makes for an inviting place to sit back with a cerveza and enjoy the show. 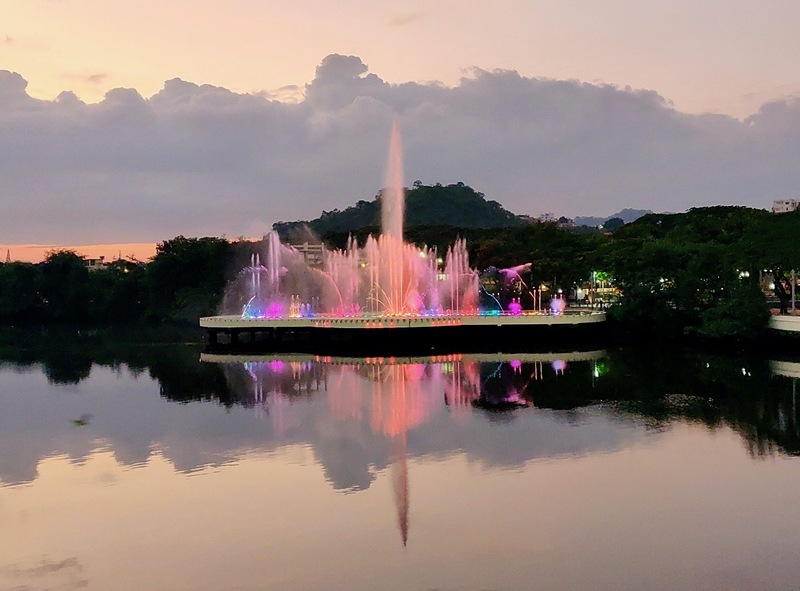 If you’re in Guayaquil on a weekend evening, don’t miss seeing the Monumental Fountain of Dancing Waters come to life. 🕒 Hours: 7:00 pm – 9:00 pm is the official time, yet we found they start a bit earlier. 📍 Location: The fountains themselves are here. We suggest watching from across the river on the upper platform, located here. 13) Eat Congrejo Criolle – That’s Crab! If you only have one dinner planned while passing through Guayaquil, make it one of the city’s most iconic dishes: cangrejo criollo, or creole crab! The experience of eating cangrejo criollo is a really one of the best things to do in Guayaquil. And it is an experience! These red mangrove crabs are a local favorite in Guayaquil. After the crabs are boiled, it’s upon you to do the rest of the work. That’s half the fun! Mallets are brought to the table to help reach the crab meat after tearing into the claws and legs with your bare hands. The entire restaurant is filled with a symphony of people pounding away on the tables. Bibs help to protect from the inevitable resulting splatter. But these crabs are every bit as delicious as they are messy to eat. These red crabs are boiled up in a big pot of beer after all, along with spices like cumin, oregano, and garlic to perfectly flavor the delicate crab meat. 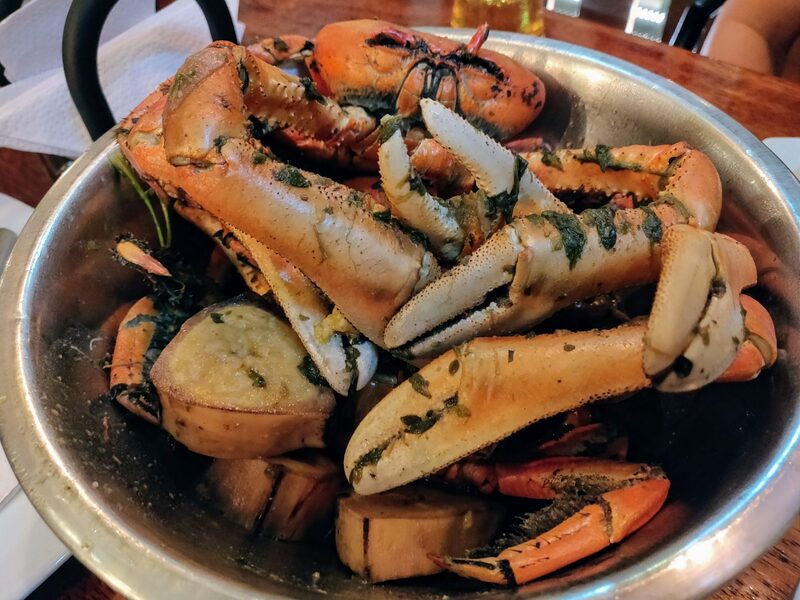 It may take some time and energy to crack into each of the crab legs, yet each tasty bite will remind you that it’s definitely worth the effort! So where’s the best place in Guayaquil for cangrejo criollo? That’s a matter of opinion, of course. And there’s no shortage of crab restaurants or opinions about the matter. Red Crab tends to be most often recommended in guidebooks. 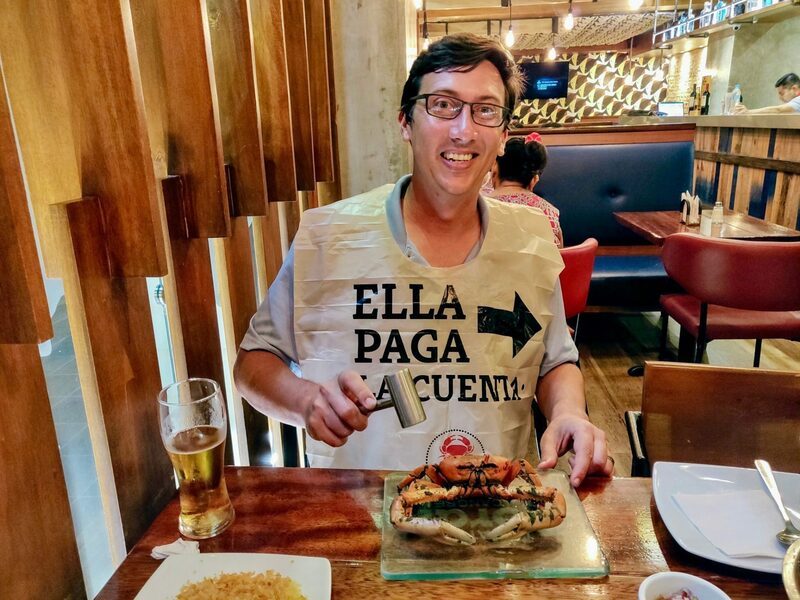 Los Cangrejos de Pepito Loza receives the highest ratings on TripAdvisor. La Pata Gorda was most often recommended to us by locals and has a central position near Iguana Park, among other locations. Whichever crab restaurant you choose, just slap on a bib and get cracking! 💲Cost: Varies by restaurant. The cangrejo criollo at La Pata Gorda costs $12.77. 🕒 Hours: Check with restaurant. Pilsener is Ecuador’s national beer, which can easily be found all throughout the country. Yet Guayaquil presents a unique opportunity to drink this cerveza right where it originated in Guayaquil’s colorful Las Peñas neighborhood, having been brewed here since the late 1800’s! What began brewing up in an icehouse on the colorful hill way back in 1887 has become Ecuador’s most popular beer. 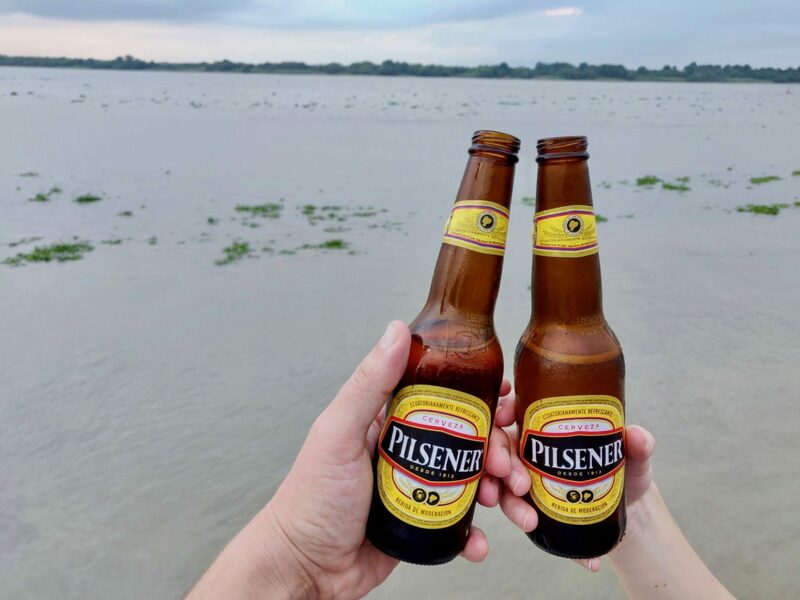 Pilsener is particularly celebrated in Guayaquil and even a riverfront plaza has been named in its honor. On the actual site of the historic brewery, the Pilsener brand has more recently (2013) opened a Pilsener-themed restaurant that’s appropriately named Casa Pilsener. It’s a nice atmosphere with both indoor and patio seating. The beers there are perhaps slightly overpriced, but you’re paying for the ambiance and the opportunity to drink the Pilsener in the brewery’s original location. For better value, just walk up the adjacent steps where a nice family will serve you Pilsener in a giant cup from the bottom floor of their apartment. It’s here you can gaze down onto the location of that original riverfront brewery. But how is this Ecuadorian Pilsener beer? It’s nothing great but it does act as a decent thirst-quencher in Guayaquil’s tropical heat. Ironically, this beer is not a true pilsner as the brand name would suggest; but rather a pale lager beer (like a Budweiser, Corona, etc). Whatever the case, it’s welcomed and refreshing after a day of roaming around Guayaquil. 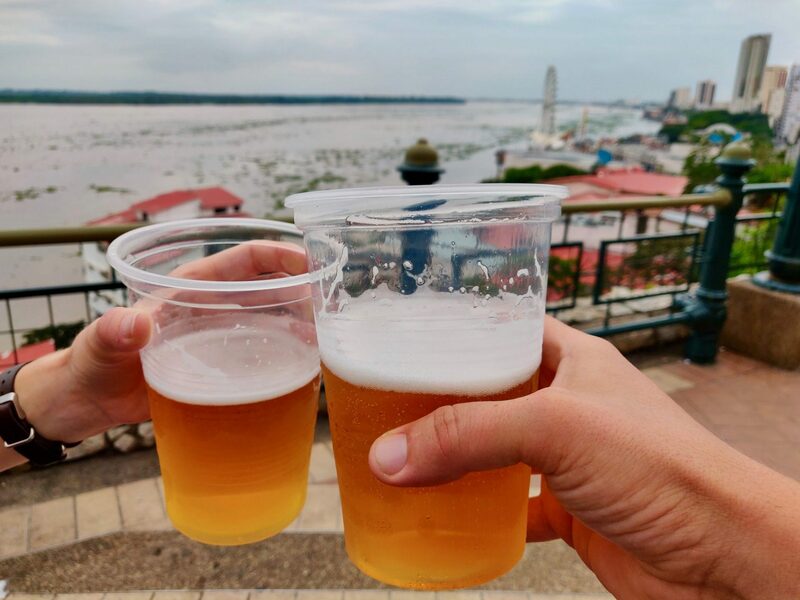 💲Cost: Beers in Guayaquil tend to be priced $1 on the low end, $4 on the high end. 🕒 Hours: Casa Pilsener opens at Noon and closes late. 📍 Location: Casa Pilsener is located here. Our secret little overlook and big cheap beers is located here on Callejon Del Galeon. 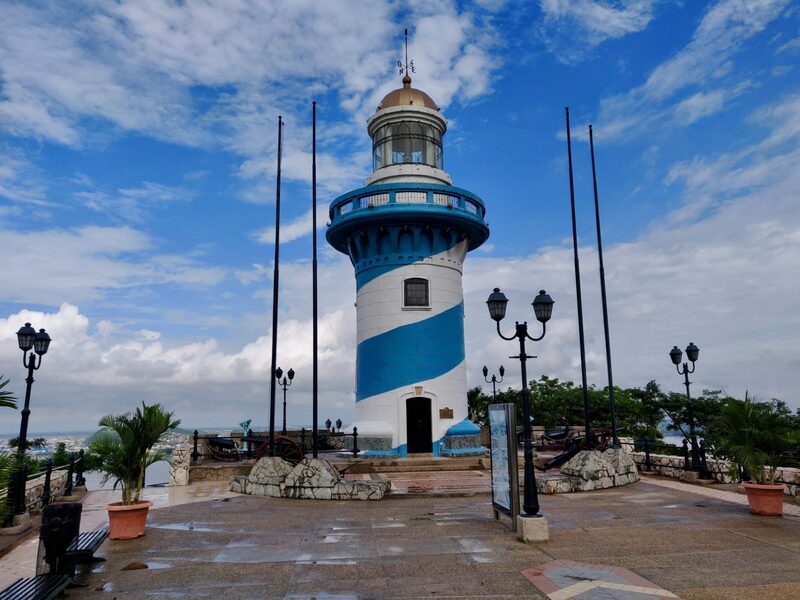 For those who are staying in Guayaquil for more than a few days, you may want to consider taking a day trip or two to fill the extra time after checking out all the other aforementioned things to do in Guayaquil. From Guayaquil there are train trips to take, eco-tours to pursue, and even cocoa plantations to visit! Here are a few suggested Guayaquil day trips to consider. 🐒 Bosque Protector Cerro Blanco – This dry tropical forest is known for its bird and wildlife, particularly the resident monkeys. A series of guided hikes are offered up the hilly terrain that is best pursued on the weekend, as people visiting during the week have been turned away. It’s located about 30 minutes away from downtown Guayaquil and can be reached by public bus or even Uber. Or consider this guided tour. 🐬 Puerto El Morro – Approximately 90 minutes from Guayaquil, towards the coast are a series of waterways known for its wildlife and particularly dolphins. Taking a small boat tour here usually reveal the wild dolphin residents in addition to endemic birds in the tropical setting. Try this tour on Viator. 🛶 Manglares Churute – This is Ecuador’s largest mangrove reserve that is particularly known for the endemic birdlife that abounds here. Trips to Manglares Churute usually include a walk around the dry forest and a small motorized canoe ride around the mangroves for birdwatching. 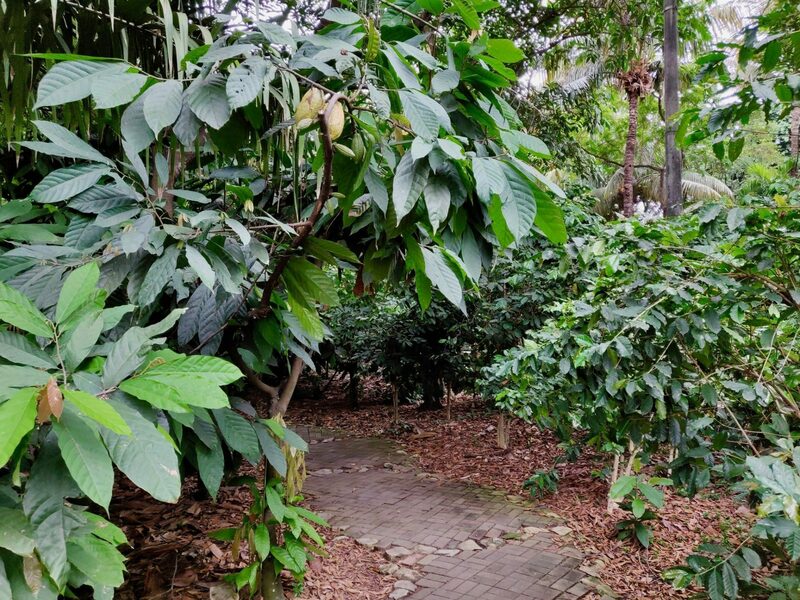 This small group tour includes that in addition to a chocolate tasting at a cocoa plantation along the way! Check availability and prices. 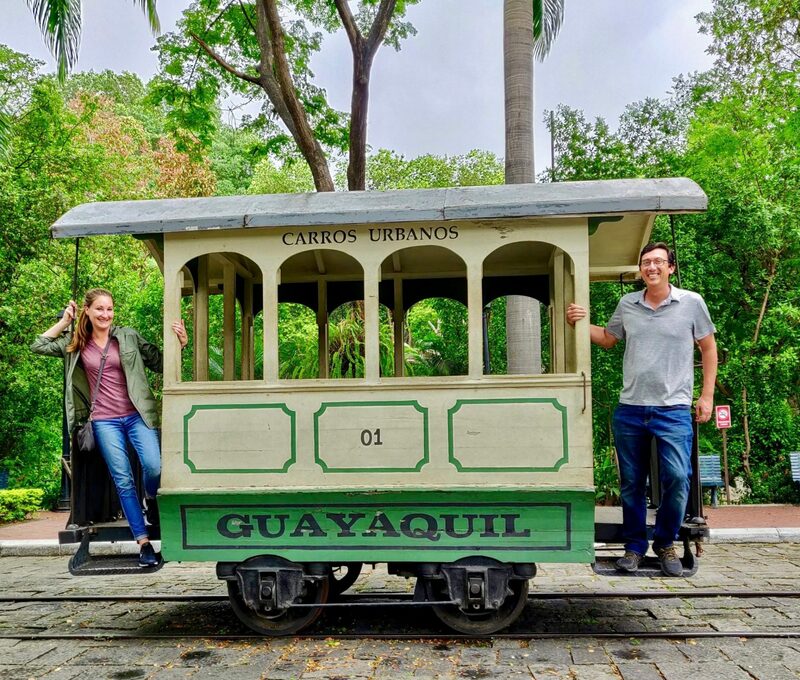 🚂 Tren de la Duraza – Every weekend it’s possible to take the “Train of the Sweetness” from Guayaquil to the town of Bucay. Along the way, passengers go through farming plantations while learning about cocoa and sugar production. Ultimately the train arrives to more of a cloud forest environment. It’s at this destination of Bucay where an optional waterfall trek can be pursued before returning towards Guayaquil. 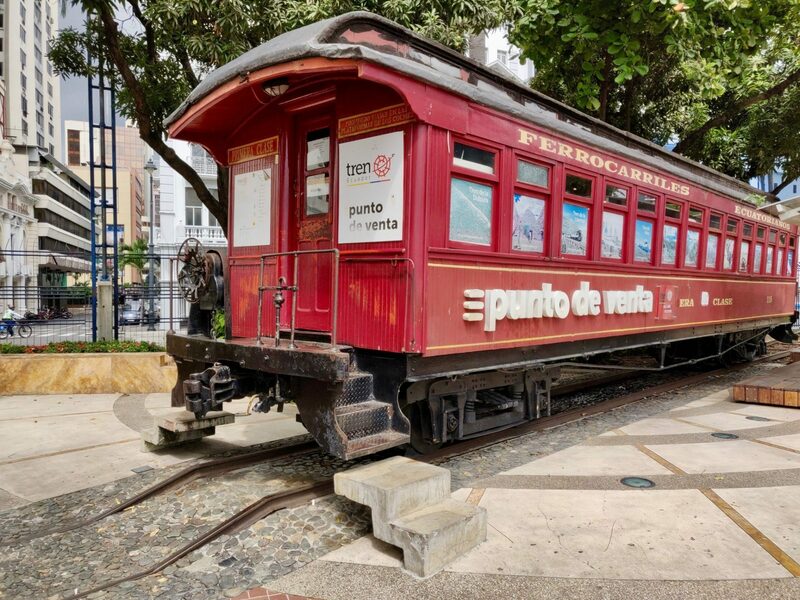 The train tour runs Fridays-Sundays only and tickets can be purchased at the antique rail car found along Malecon 2000 or online. More info on TrenEcuador. In addition to all the things to do in Guayaquil, we want to impart some tips and safety advice in an effort to make this Guayaquil travel guide complete. Many travelers ask if Guayaquil is safe. So we’re here to shed some light on that topic. Guayaquil sometimes carries an unsafe reputation. Yet we found that to be a largely unfair assessment, despite having some legitimate safety concerns. The city has come a long way over the past few decades to increase safety in Guayaquil and make tourists feel safe. And we do feel safe here. We’ve never once had any safety concerns in Guayaquil. Guayaquil is largely a big, beautiful, friendly and modernizing city. 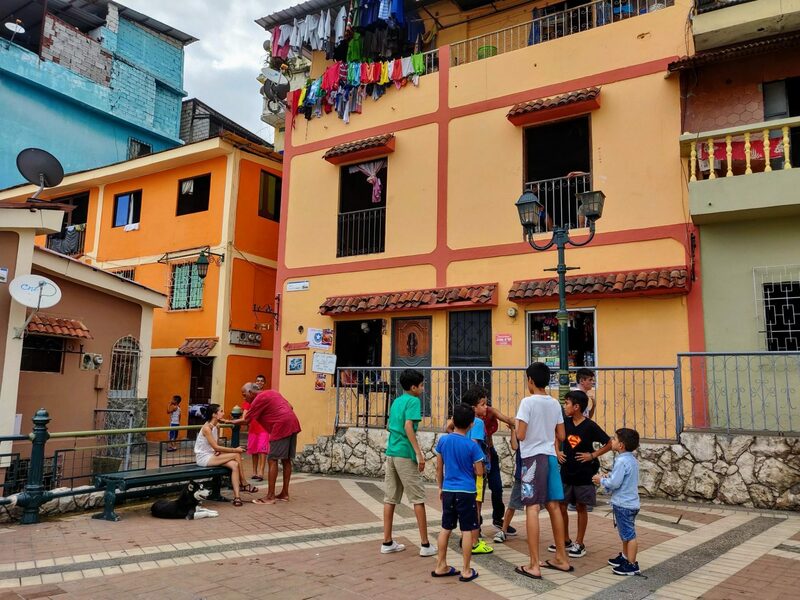 The tourist areas of Guayaquil are places where children play freely and families come out of their apartments to enjoy life. Personally, we wouldn’t let any safety concerns prevent a visit to Guayaquil. Most government travel advisories about Guayaquil would agree with that and simply advise taking normal precautions. That said, there are precautions to be aware of while roaming around Guayaquil. There are some bad neighborhoods in Guayaquil that are easily avoided, like most major cities around the world. In recent times, armed robbery or any violent crimes against tourists have been rare in Guayaquil. Any such instances mostly all have occurred outside of Guayaquil’s main touristic areas mentioned in this travel guide. Guayaquil’s main touristic areas all have a nice presence of tourist police and security guards to help ensure safety. Perhaps the biggest safety concern in Guayaquil, even in the touristic areas, is simply petty theft. There are reports of pick-pockets targeting tourists. It’s not rampant and widespread, but it has been known to happen. Personally, we did not notice such a threat like we did in Quito, where we saw and even experienced many pickpockets in Ecuador’s capital. Yet a threat of pickpockets and theft does exist in Guayaquil. This should be no cause for major concern or paranoia when walking around the city. Yet it’s a good idea to simply be aware and keep vigilant of your pockets and belongings, particularly when in any crowds. 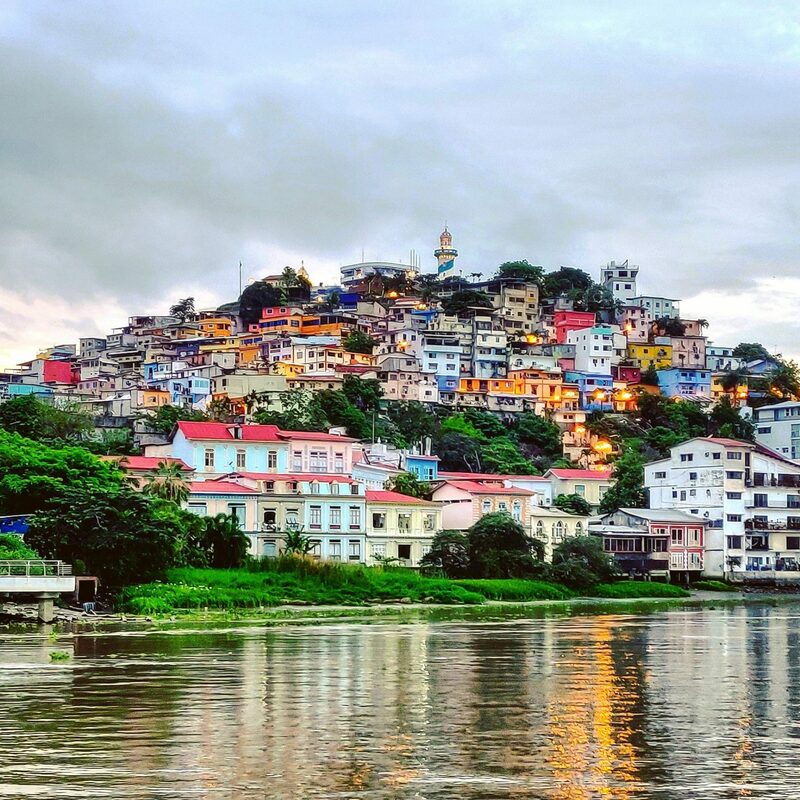 And while Guayaquil’s touristic areas are largely considered safe for travelers, it can be possible to stray off the beaten path and into trouble. It’s best to stick to the main tourist areas and particularly so at night. There’s also a known scam in Guayaquil involving false taxis. We recommend only using registered taxis. Better yet, use Uber which is trackable, has security features, and is largely deemed as one of the safest way to get around Guayaquil. Really, to stay safe in Guayaquil is simply to use common sense tactics that travelers would use in any large city. Don’t get involved with drugs. Don’t get into a stranger’s car. Don’t wear flashy jewelry. Be vigilant of your surroundings. Don’t carry large sums of money. Stick to the touristic areas. Don’t get drunk. Stay clear of bad neighborhoods. ☀️ Beware of the sun. Guayaquil is hot, hot, hot. Don’t forget to pack sunglasses and a hat. Also be sure to pack sunscreen with you since it tends to be much more expensive in Guayaquil compared to US prices. Use at least SPF 50. We like this Banana Boat sunscreen that Amazon sells at a good price. ☔ Jan-April is rainy season. If traveling through Guayaquil between January through April, be sure to pack a good rain jacket or a compact travel umbrella like this. While it doesn’t rain all day, every day during those months, it will likely rain during your visit. 💸 Cash is king. More and more places are beginning to accept credit cards in Guayaquil, but cash is more often the norm. The currency in Ecuador is the US dollar and ATMs are frequent to withdraw. 💵 Use small bills. Almost anywhere in Guayaquil won’t accept $50 or $100 bills. Come with smaller change as you’ll otherwise have a very difficult time breaking that $100 note. Even twenties can sometimes be cumbersome to break. 🚰 Don’t drink the water. The tap water in Guayaquil is generally not safe to drink. Use bottled water only. Also, consider traveling with this compact LifeStraw. We have one and it’s come in handy a few times during our travels when water wasn’t drinkable and stores were closed. 💦 Stay hydrated. You’ll likely sweat a lot more in Guayaquil than you’re accustomed to back home. Make it a point to stay hydrated and drink lots of water. It’s easily found all over the city. 🚽 Know where to go. After drinking all that water, you’ll certainly need to pee. Thankfully, there are many free public toilets all throughout both malecons and most all Guayaquil’s tourist areas. You’ll just need a dime (10 cents) to buy some toilet paper. And remember, in Ecuador used toilet paper goes in the bin, not in the toilet. 🦟 Keep mosquitoes away. Being the tropics, there are mosquitos buzzing around Guayaquil. Zika has almost disappeared from the region, although the rare case does still pop up. It’s best to protect yourself from those pesky disease carrying mozzies. You can use the heavy-duty stuff with DEET but we find that this natural Repel Lemon-Eucalyptus repellent works well, isn’t as harsh on your skin, and better for the environment, particularly if you’re going in the water. 💬 Learn Some Basic Spanish. There’s not much English spoken along the streets of Guayaquil, so it can be a great idea to learn up on some basics before a trip here. Even simple pleasantries can go along way with pointing and a smile. ⚠️ Important: Be Sure to Have Travel Insurance in Guayaquil. You never know what could go wrong during a trip to Guayaquil, from a minor incident like lost luggage or flight cancelation to a major disaster like an earthquake or a tsunami. Travel insurance will not only come to your rescue to help you out of a jam, but will also cover those unexpected costs. Whether you get into a car accident or get pickpocketed along Guayaquil’s malecon, travel insurance will come to the rescue. We always use travel insurance while roaming around Ecuador and recommend it. We like World Nomads, which has what we’ve found to have the best price and coverage combination (particularly for longer trips). Enter the dates for your trip to get a quick estimate. 💼 What to Pack for Guayaquil: Pack for Guayaquil as you would for any hot weather destination. We recommend plenty of dry-wicking clothing and sun protection. Be sure to check out our Ultimate Travel Packing List for all our packing tips and travel gear ideas. We hope this Guayaquil travel guide has helped to show all of our favorite things to do in the sprawling city in Ecuador. 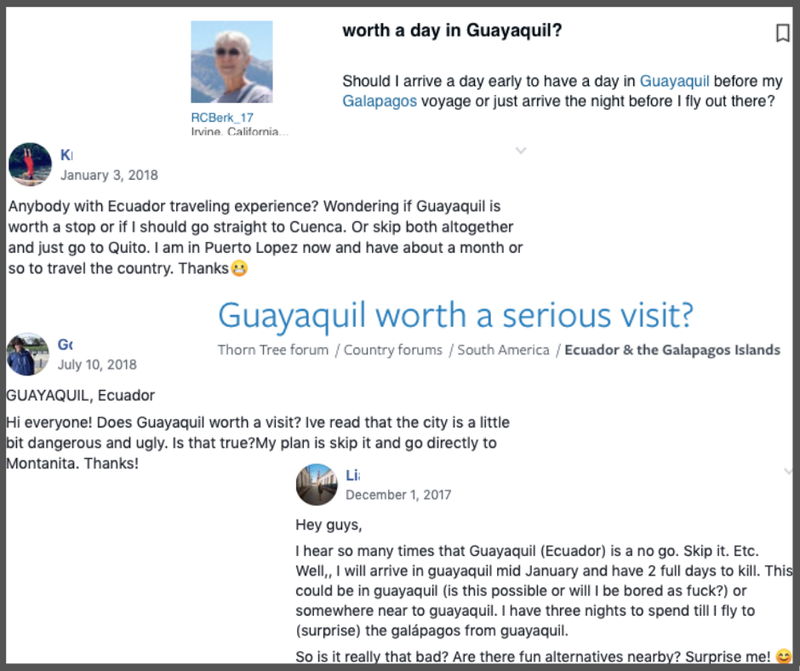 If you’ve used this guide to help plan a trip to Guayaquil, please let us know in the comments, as we always love to hear from people who may have stumbled across our posts. Or if you have any questions as you plan a trip to Guayaquil, feel free to ask and we’ll try to answer. 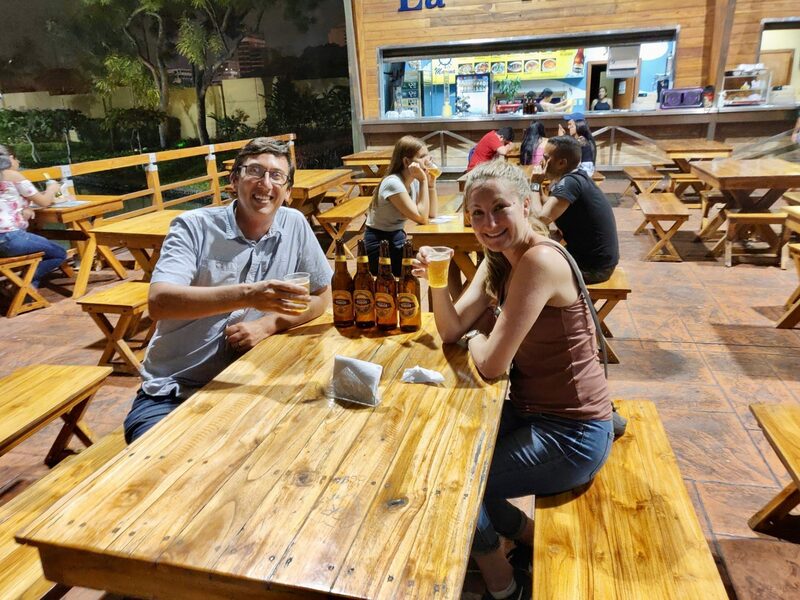 Finally, if you’ve been here and have your own favorite thing to do in Guayaquil, let us know so we can check it out next time and keep this post up-to-date! If this post has been helpful to your planning, consider staying connected with us by giving us a follow on Facebook Page or Instagram. We’ll help continue to work some travel inspiration, helpful tips, and ideas into your social media feeds. Where to Next in Ecuador? If you found this Guayaquil Travel Guide helpful, then you may be interested in other travel guides we’ve published about Ecuador. ⛪ Cuenca is Ecuador’s third largest city and colonial gem in the Andes that’s been designated as a Unesco World Heritage Sites. The city is nicknamed the “Athens of Ecuador” for its history and culture, yet lots of adventure also abounds in the mountains that surround. And it’s all only less than a 4-hour drive from Guayaquil! 🚣 We weren’t sure if it was possible to travel by boat from Ecuador to reach the Amazon River. So we set off on a rural adventure to find out. You can read our tale of how it went here. Your post has just convinced me. Guayaquil is worth of a stop. The wooden colonial architecture of Numa Pompilio Llona is simply stunning! And I wouldn’t mind climbing the 444 steps to the top of Cerro Santa to reach “El Faro” lighthouse to enjoy the 360-degree panoramic views down below. It’s so worth a stop! 🙂 And tackling those 444 steps is worth the views from the stop, yet is also just a fun experience onto itself. Well, once you catch your breath, hehe! Guayaquil sounds like such a charming place to visit. So many of these things appeal to me. The pirate ship at sunset would be such a great way to end a busy day. A bike ride around Isla Santay to see the colorful fishing village would be dreamy. For sure I would love to see all the wildlife. If we every get to go to the Galapagos, I will be sure to plan in several days in Guayaquil. Yeah this big city in Ecuador ending up being so much more charming than we had ever expected! 🙂 It was great to see so much plentiful birdlife/wildlife on Isla Santay, so close to the city itself. What a great little refuge that island is! Good to know that Guayaquil has improved its infrastructure, makes it more attractive. Las Peñas looks stunning with its colorful facades! Row boating seems such a fun option there. Great place to holiday. 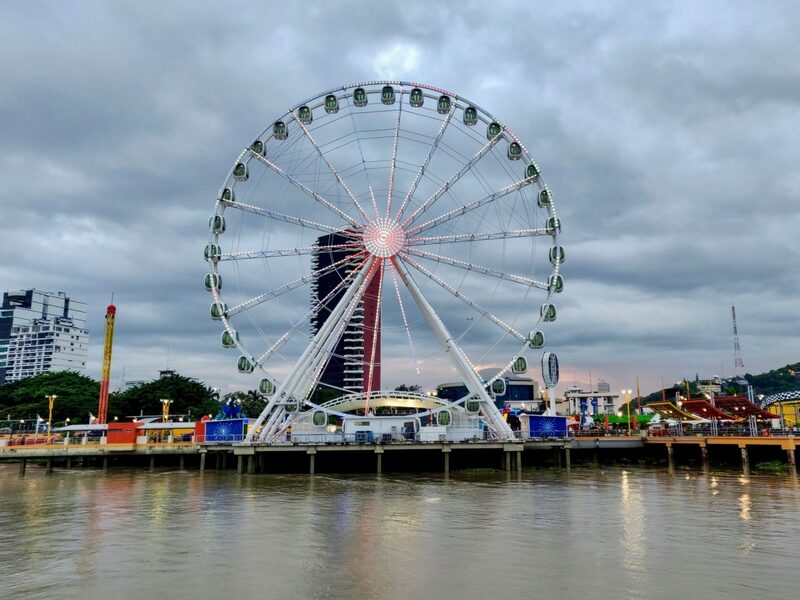 Since we are travelling as a family, I’d go for a Ferris Wheel ride and the Boat Cruise as our priority when going to Guayaquil. My kids would also love to see the Dancing Fountain Waters and my husband would surely love the Big Crab! Great precaution tips, it’s very helpful and a heads-up for all travellers. Come to think of it, Guayaquil makes for a particularly nice place for families. There are lots of things to do in Guayaquil with kids! 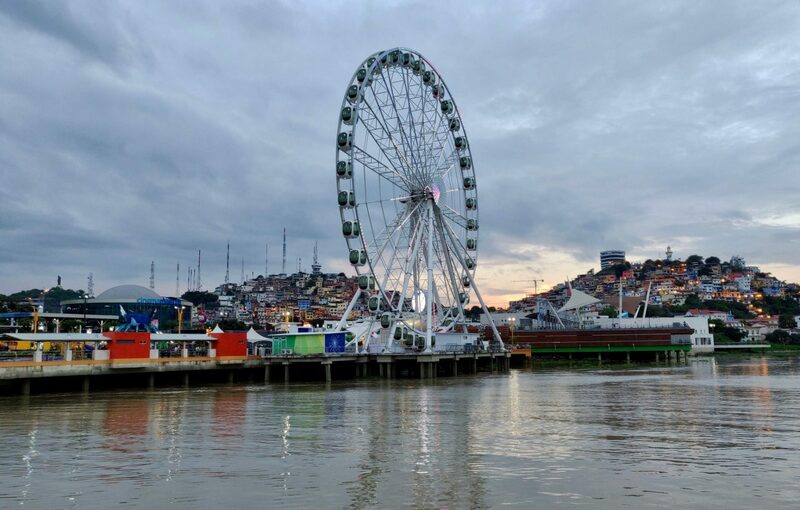 The Ferris Wheel and Pirate Cruise would for sure appeal to niñas and niños traveling to Guayaquil. Also, not mentioned in this post, there are many kiddie rides, adventure parks, and arcades spread across the Malecon 2000 too. I didn’t even know there was so much to do in and around Guayaquil/ Had always heard of the place only in respect to Galapagos. The Guayaquil Riverfront and Parque Historico are such great places to experience the town! Plus I love quirky neighborhoods and those pictures of Las Peñas stole my heart!! We have South America on the books for 2020 so I am starting to make my list of things to see and do. It looks like Quayaquil looks like a spot worth visiting. I did not know that there is the biggest ferris wheel in South America in Quayaquil. Love when cities have lots to see and do that are free or cost very little. We would definitely want to go to the top to get a panoramic view over the city. Love all those colourful buildings. Thanks for introducing Quayaquil. Sounds like you spent a fair amount of time in that region. I was in Quito a few days before going to the Galapagos and missed Guayaquil completely except for changing planes. We went up to Ibarra after. Loved exploring Ecuador and I appreciate your precautions. I never felt unsafe but it does pay to be smart about your belongings and stay out of bad neighborhoods no matter where you are in the world. Great post. We had initially did the same thing a few years ago when we simply transferred through Guayaquil from the Galapagos. 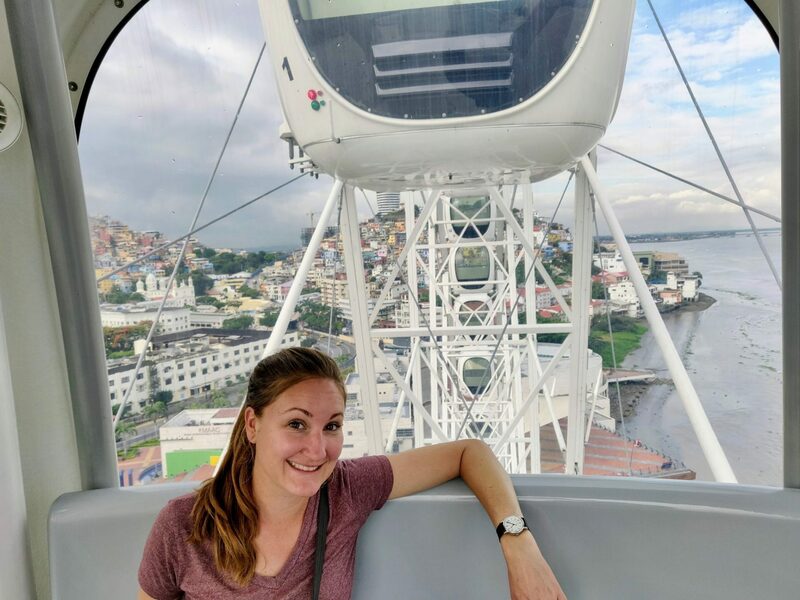 So upon returning to Ecuador we wanted to take the time to explore the city and see what it may have to offer and were so pleasantly surprised! 🙂 Hence this post. We should be heading back towards Quito later this month and look forward to potentially visiting Ibarra for the first time ourselves.